2002-10-24 Assigned to TEMPLE-INLAND FOREST PRODUCTS CORPORATION reassignment TEMPLE-INLAND FOREST PRODUCTS CORPORATION ASSIGNMENT OF ASSIGNORS INTEREST (SEE DOCUMENT FOR DETAILS). 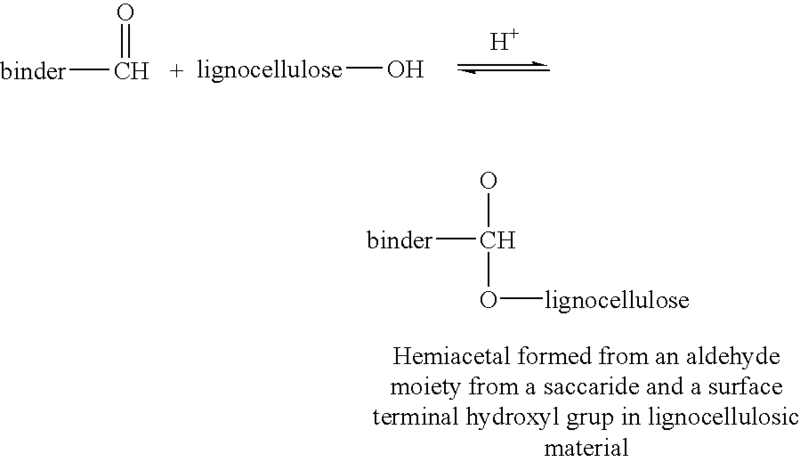 Assignors: CAPPS, CHARLES L.
A novel resin for binding composite lignocellulosic, cellulosic and non-cellulosic products is disclosed. The resin is comprised of one or more isocyanates, one or more saccharides, one or more polyols, and water. Preferaby, the saccharide is a polysaccharide comprised of corn syrup. Preferably, the isocyanate is a polyisocyanate and the polyol is an ethylene glycol. Also disclosed are methods for preparing and applying the resin as well as the products prepared from the resin. The present application claims the benefit of U.S. provisional application Serial No. 60/335,945, filed Oct. 24, 2001, and entitled “Saccharide-Based Resin for the Preparation of Composite Products,” which is hereby incorporated herein by reference. While the invention is susceptible to various modifications and alternative forms, specific embodiments thereof are shown by way of example and will herein be described in detail. It should be understood, however, that the examples are not intended to limit the invention to the particular form disclosed, but on the contrary, the intention is to cover all modifications, equivalents and alternatives falling within the spirit and scope of the present invention as defined by the claims. 2. The resin of claim 1 wherein the one or more saccharides are present at a concentration of between about 25 and about 65 weight percent of the resin, the one or more isocyanates are present at a concentration of between about 1 and about 30 weight percent of the resin, and the one or more polyols are present at a concentration of between about 1 and about 10 weight percent of the resin. 3. The resin of claim 1 wherein the one or more saccharides are present at a concentration of between about 50 and about 65 weight percent of the resin, the one or more isocyanates are present at a concentration of between about 5 and about 20 weight percent of the resin, and the one or more polyols are present at a concentration of between about 3 and about 5 weight percent of the resin. 4. The resin of claim 1 wherein the one or more saccharides comprise a polysaccharide. 5. The resin of claim 4 wherein the polysaccharide comprises corn syrup. 6. The resin of claim 1 wherein the one or more polyols comprise 1,2-propylene glycol. 7. The resin of claim 1 wherein the one or more isocyanates comprise a polyisocyanate. 8. The resin of claim 7 wherein the polyisocyanate comprises a diphenylmethane diisocyanate. 9. The resin of claim 7 wherein the polyisocyanate is present at a concentration of about 7.5 weight percent of the resin or less. b. then mixing the one or more saccharides and the one or more isocyanates with water. 11. The method of claim 10 wherein the one or more saccharides comprise a polysaccharide. 12. The method of claim 11 wherein the polysaccharide comprises corn syrup. 13. The method of claim 10 further comprising mixing the one or more isocyanates with one or more polyols prior to step (a). 15. The composite product of claim 14 wherein the composite product is a non-cellulosic composite product. 16. The composite product of claim 15 wherein the non-cellulosic composite product is comprised of a material selected from the group consisting of polyurethane, plastic, organic polymer systems and metals. 17. The composite product of claim 14 wherein the composite product is a composite wood product. 18. 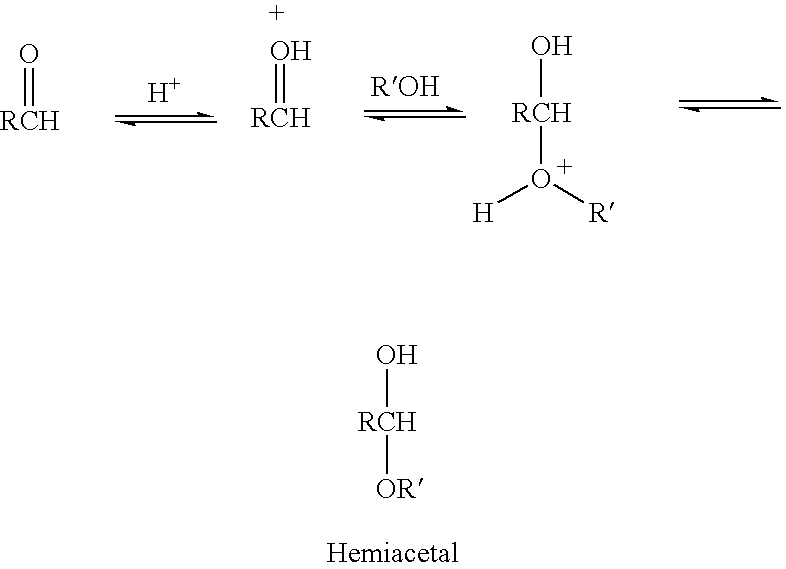 The composite wood product of claim 17 wherein the one or more saccharides are present at a concentration of between about 25 and about 65 weight percent of the resin, the one or more isocyanates are present at a concentration of between about 1 and about 30 weight percent of the resin, and the one or more polyols are present at a concentration of between about 1 and about 10 weight percent of the resin. 19. The composite wood product of claim 17 wherein the one or more saccharides are present at a concentration of between about 50 and about 65 weight percent of the resin, the one or more isocyanates are present at a concentration of between about 5 and about 20 weight percent of the resin, and the one or more polyols are present at a concentration of between about 3 and about 5 weight percent of the resin. 20. The composite wood product of claim 17 wherein the one or more saccharides comprise a polysaccharide. 21. The composite wood product of claim 20 wherein the polysaccharide comprises corn syrup. 22. The composite wood product of claim 17 wherein the one or more polyols comprise 1,2-propylene glycol. 23. The composite wood product of claim 17 wherein the one or more isocyanates comprise a polyisocyanate. 24. The composite wood product of claim 23 wherein the polyisocyanate comprises a diphenylmethane diisocyanate. 25. The composite wood product of claim 23 wherein the polyisocyanate is present at a concentration of about 7.5 weight percent of the resin or less. 26. The composite wood product of claim 17 wherein the composite wood product comprises a particleboard. 27. The composite wood product of claim 17 wherein the composite wood product comprises a medium density fiberboard. DE69113808D1 (en) 1990-12-14 1995-11-16 Diteco Ltda An adhesive composition consisting of isocyanate, phenol formaldehyde and tannin for the production of plywood for exterior application. CN1151190C (en) 2004-05-26 Thixotropic wood binder compsns.